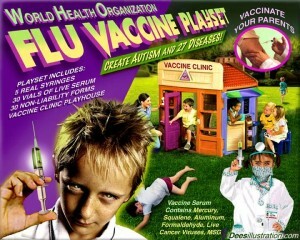 Every year, flu vaccine propaganda is ramped up by the pharmaceutical industry and its mouthpiece media, which then gives way to a second round (pun intended) of vaccine propaganda pushing toxic vaccinations for a variety of diseases, only then to be followed by the demonization of nutritional supplements. Around mid-January, rinse and repeat – (flu, childhood vaccine, and anti-supplement propaganda). Thus, at the end of 2013, the American public was met with an onslaught of fear-mongering propaganda predicting flu pandemics and imminent death if vaccination was not immediately sought. We then saw the major propaganda assault regarding the safety and effectiveness of vitamins and minerals by the medical and pharmaceutical industries. 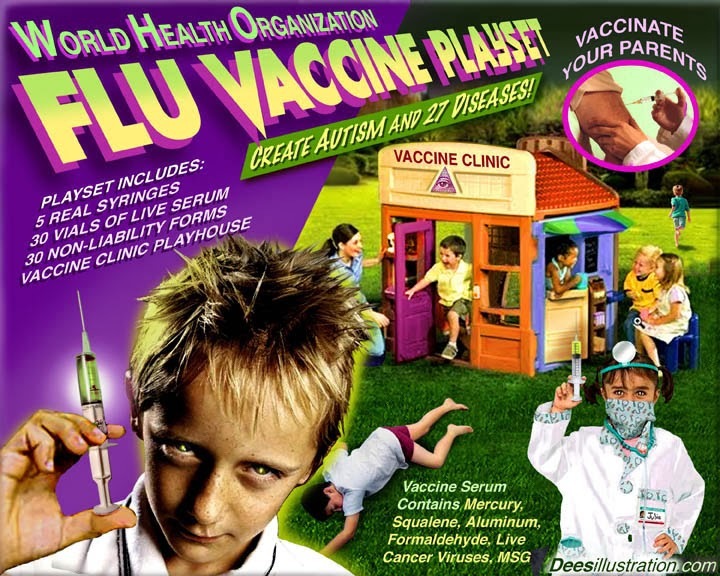 Now, in early 2014, we are witnessing another propaganda assault against the “anti-vaccination” movement with claims of increased outbreaks and apocalyptic scenes of sickness. The latest propaganda push comes not from the medical industry per se, however, but from an organization usually more focused on the spread of globalism, free trade, culture creation, and other domestic/international governmental policies, the Council on Foreign Relations. Following a volley of cynical assaults on parents and other individuals who have investigated the science, process, and risks of vaccination (or experienced these side effects firsthand), the CFR has created an interactive map of what it has deemed outbreaks of preventable diseases resulting from the anti-vaccination movement. This map was immediately circulated throughout the corporate media, with suggestions not only that non-vaccinators are crazy and irresponsible but that they do not have the freedom to make the choice not to vaccinate. In this regard, the LA Times report by Michael Hiltzik entitled “The toll of the anti-vaccination movement in one devastating graphic” comes to mind. Putting aside Hiltzik’s trendy title and pathetic attempts at research and citation, as well as his nonsensical claims regarding Jenny McCarthy and Andrew Wakefield, it is important to go to the source of the actual research (of which Hiltzik, if his article is anything to go by, is clearly incapable doing himself). Taking a look at the interactive map provided by the CFR, one may initially be struck by the number of highlighted bubbles placed across the map of the world indicating disease outbreaks. Many of these areas, of course, do represent outbreaks of the respective diseases – some locations with over 10,000 cases of the measles, 5,000 cases of whooping cough, and 24,000 cases of rubella for instance. Before addressing the numbers and the locations, however, it is important to point out the first error of the CFR – the labeling of the chart as “Vaccine-Preventable” outbreaks. As I have discussed in my article “The Antibody Deception,” the only way that vaccine effectiveness is measured is by the presence of antibodies specific to the disease in the bloodstream. However, antibody presence does not equal immunity. Thus, until the scientific community finds a way to actually determine the effectiveness of vaccines, the term “vaccine preventable” is misleading and should therefore no longer be used. Another misleading aspect of the chart is the actual definition of an “outbreak.” To most rational human beings, an “outbreak” represents the presence of a disease which then spreads quickly to a relatively large number of people within a given time frame context, not simply an isolated case of the disease in only one person. To the CFR, however, one isolated case of a disease is indeed considered an “outbreak.” All one has to do is hover over many of the bubbles on the map to see that the CFR has attempted to show an outbreak where none actually existed. For other countries, however, Pertussis is not the main threat. Measles, if the statistics of the CFR are accurate, is the most common “outbreak” culprit. Measles “outbreak” rates (true outbreak numbers) are relatively high in Africa (particularly sub-saharan), the Middle East, some Asian countries and, interestingly enough, Europe. In Europe, the UK is the most afflicted with measles outbreaks. Although the CFR would have the readers believe that the UK has had such a disturbing outbreak of measles because of the refusal of many parents to inject their children with toxic chemicals, the evidence to support this claim is simply not there. Again, I refer the reader to my article “The Antibody Deception,” as well as to the scientific evidence suggested that vaccines are wholly ineffective. Thus, if vaccines are themselves ineffective, then a lack of vaccines would not exist as the reason for measles outbreaks. As is demonstrated in my article, “Evidence Contradicts Whooping Cough Pro-Vaccine Propaganda,” vaccines are not, in any way, the reason for the reduction of diseases seen in the latter half of the 20th century. Indeed, one need only take a closer look at the historical graphs to see that the overwhelming majority of these diseases were on their way down before the vaccines were even introduced. What did begin the reduction and elimination of disease was an increase in public sanitation, better access to clean water, and the general rise of living standards. Indeed, living standards play a vital role in the prevalence or reduction of disease in a society. Economic depression and war are quite possibly the two most important trigger forces known to man that can lead to an epidemic. During either of these two situations, the living standards of the vast majority of people are lowered, access to clean and plentiful food and water are reduced, sanitation standards are lowered, victims are in a constant state of stress, and housing conditions are forced to accommodate more and more people in less clean, smaller spaces. No rational individual can deny that the entire globe is now gripped in a worldwide economic depression. The United States, Canada, UK, Europe, and the entire Third World has been suffering through drastic unemployment, austerity, war, and the slashing of living standards. The UK has been in gradual decline ever since before the Second World War and, along with the occasional economic shock, took an even further nosedive down the economic ladder. Perhaps the fact that the British people suffer from systemic unemployment, vastly reduced living standards, and Malthusian healthcare practices plays a larger role than faith-based vaccination science could ever dream. Furthermore, it is important to note the levels to which immigration has been encouraged by Europe and the UK in particular. Indeed, the doors to Europe have been opened wide to immigrants from across the world, particularly African and Middle Eastern countries. The UK itself has multiplied that immigration by drastic numbers due to an attempt to socially engineer British culture. Thus, strapped in the middle of a worldwide economic depression which has hit Britain particularly hard, the UK was also strapped with a sudden influx of immigrants who were either left to their own devices with little assistance, competed with British workers for jobs, or allowed to obtain welfare payments. Regardless, immigrants in the UK now serve the purpose of acting as a permanent scab community as well as a permanent underclass. These immigrants, however, faced with the choice between extremely low wages, welfare subsistence, or general unemployment are often packed together in culture-specific neighborhoods and poor living conditions – the latter being a recipe for the prevalence of disease. Keep in mind that the countries from which many of these immigrants come are also the countries that have experienced such high rates of measles. In addition to the potential causes of the diseases in question, it should be noted that the sources from which the CFR map was compiled does not come entirely from official national reporting agencies like the U.S. CDC or other relevant agencies (although some numbers do come from the CDC, WHO, and other organizations). Most of the information presented in the CFR map comes from reports in mainstream media outlets, whose claims may or may not match up with the actual numbers of disease outbreaks. In fact, many of these outlets would not even be considered credible in the eyes of many mainstream agencies if the results of the CFR “research” was not in accordance with an accepted agenda. As Sayer Ji points out, most of these source are “simply rebroadcasted official statements of state- or private medical establishment-sponsored propaganda.” These media outlets include many operations like PolioEradication.org, a rabidly pro-vaccine organization as well as what the CFR, LA Times, and other mainstream media outlets would normally label “unreliable” sources such as BrownwoodNews.com or state/county agencies such as DavisClipper.com. Clearly nothing more than a major pro-vaccine PR push, the CFR map actual contains sources that disprove the claims it is intending to make. Such is the case with the inclusion of a report from the Springfield News Sun, which actually attributes one of the causes of the cases of Pertussis to the Pertussis vaccine itself. While the numbers provided by the CFR can be dissected endlessly, it is also important to point out that the CFR map and research was not entirely the result of the labor of the CFR itself. Indeed, the funding for the PR campaign was provided by the Bill and Melinda Gates Foundation. The Gates Foundation is widely known for its pro-vaccine efforts, both in terms of financing and promotion, thus hardly making it a source of impartiality. In addition to its support for vaccination campaigns at home and abroad, however, the Gates Foundation is also known for the widespread damage these programs have caused. Please see my article “Coming Soon: ‘On Demand’ Nano-Vaccines Funded By Bill Gates” in order to get an idea of the fruits of Gates’ labor in the field of vaccination and public health. Gates has also been instrumental in the development, support, and maintenance of a surveillance program aimed at monitoring “anti-vaccine” groups. Clearly, the CFR’s map cannot be taken seriously, and is simply a higher order expression of at best subpar health reporting, at worst baseless propaganda, demagogically projected into the media to hapless consumers whose ability to think critically and question authority is virtually non-existent. By framing advocates of non-vaccination as rabidly irrational ‘anti-vaxxers’ and blaming them for what are often non-vaccine preventable diseases — having far more to do with environmental factors such as access to clean water and basic nutrition — the CFR (and the Bill & Melinda Gates foundation who shares responsibility in creating this disturbingly inane and non-credible piece of propaganda) is joining a growing global movement, recently evidenced by UNICEF’s attack on independent health journalism related to vaccines, aimed at eliminating vaccine choice, despite increasing awareness of their true dangers and lack of effectiveness. The result of this shoddy work, however, is to further lionize a growing global movement to reject the alarmingly rapid expansion of vaccine schedules in favor of a more natural, precautionary approach to disease prevention. Although every year tends to bring a predictable round of propaganda efforts against unvaccinated people and those who choose natural methods of healthcare over the medical establishment, 2013-2014 has seen some of the most vicious and ridiculous attacks yet. The lesson of all this is that vaccination is not an individual choice to be made by a parent for his or her own offspring. It’s a public health issue, because the diseases contracted by unvaccinated children are a threat to the community. That’s what public health is all about, and an overly tolerant approach to non-medical exemptions — and publicity given to anti-vaccination charlatans like Wakefield and McCarthy by heedless promoters like, sadly, Katie Couric, affect us all. Unfortunately, such outright Communo-Fascist rhetoric does not set Hiltzik apart for ridicule and dismissal as it should. This is because Hiltzik is merely repeating a line that represents a mode of thought that has been present for quite a long time amongst the elite of society and the “intellectual class;” namely, that individuals are bereft of choice in even the most personal matters. This rhetoric has also found its way into the minds of the general public due to increased propaganda efforts aimed at stampeding them into accepting toxic injections. It is time for individuals like Hitzlik to remember that medical procedures and health concerns are indeed a public choice and that no amount of ignorance or fear on his part is a justification to remove that choice. If Hitzlik is so overcome with fear of catching a communicable disease, then perhaps he should take legitimate steps to boost his immune system. Even more so, he should take his annual vaccinations. After all, what should a vaccinated person have to fear from an unvaccinated one?